Maybe it’s wishful thinking, but memories of my childhood summers are dappled in sunshine, garden grass scorched by the sun as we took turns spraying each other with the hosepipe and praying that it wouldn’t be banned. As an adult, the Great British Summer seems a little wetter, certainly colder, the sky hung with clouds and even edible sunshine kept at bay with our strawberry season delayed by several weeks. Now that they’ve finally arrived, I’m going all out on this summery fruit. 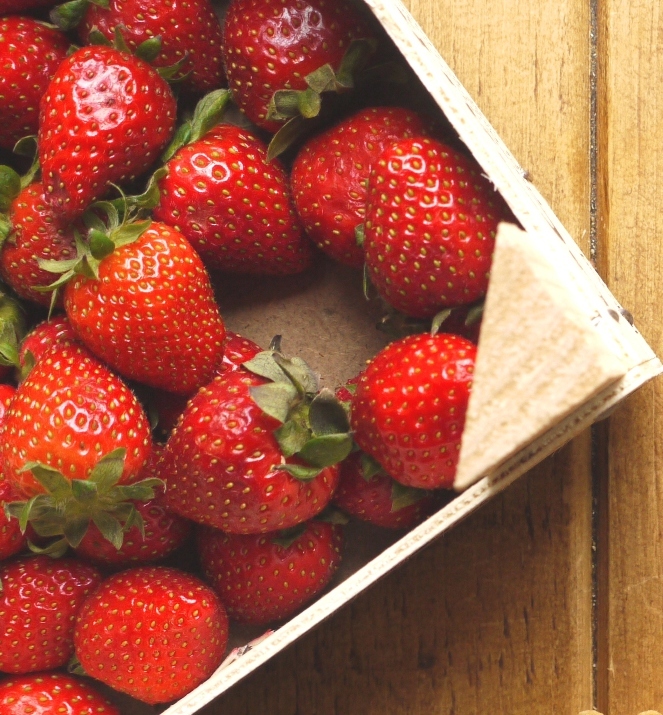 Forget buying strawberries by the punnet, it’s all about a crate: enough to eat them by the handful, make eton mess and ice cream, bake some into a cake and squash the rest into breakfast. While I’m usually happy to simply scatter strawberries over oats, I recently tried out a recipe from My New Roots in which strawberries are sweetened then spiced before being stirred through Bircher muesli. This unusual combination makes for an absolutely delicious breakfast, but is also the perfect accompaniment to a simple summer dessert. Cinnamon and ginger are warming notes I wouldn’t normally associate with strawberries – although they do seem quite fitting for the wintry weather we’ve been having – but somehow the mixture really works. The strawberries soften and marinate with the help of a little maple syrup or honey and orange zest brings it all together with a citrus kick. The cake below is as simple as they come. Good quality honey sings from a base made moist with the addition of both yoghurt and ground almonds. There’s a hint of spice with freshly ground cardamom and nutmeg. I added a little butter for flavour, but you could probably make it without, meaning a slice of this cake with a dollop of yoghurt and spoonful of sweet spiced strawberries would be just about acceptable for breakfast. The sun may be more than a little reluctant to show its face this summer, but at least we have strawberries. If you’re suffering from a lack of sunshine, make the recipe below and enjoy sweet spoonfuls of sunshine on a plate. Preheat the oven to 165 degrees C. Grease and line a 20cm round cake tin. In a medium bowl, whisk the eggs until pale and thick. Whisk in the vanilla bean paste, yoghurt, butter and honey and whisk until combined. In a separate bowl, sift together the ground almonds, flour, baking powder and soda, sea salt, cardamom and nutmeg. Fold the dry ingredients into the wet ingredients until completely combined, then scrape into your prepared tin. Bake for 20 – 25 minutes, or until golden brown on top and a skewer inserted in the middle of the cake comes out with just a few loose crumbs. Remove from the oven and leave to cool in the tin for 10 minutes before transferring to a cooling rack. In a medium bowl, combine all the ingredients. Smash some of the strawberries with your fingers to release the juices, leaving the rest whole. Cover with cling film and refrigerate for at least one hour before serving. Whip the cream until soft peaks form. Fold in the Greek yoghurt and vanilla. Slice the cake and serve each slice with a spoonful of spiced strawberries and a dollop of thick cream. Sprinkle over a few extra flaked almonds, if you like. This sounds wonderful. I love the sound of the yogurt with the spiced strawberries, the maple syrup, the cardamom, and the sweet moist cake. Bravo! A great spring dish. Yum! Strawberries and almonds – two of my favourite things. I will definitely have to give this one a try! This looks and sounds delicious…It is nice to see that you used “greek yogurt”. This is what we usually use in cakes back home in Turkey 🙂 I think the yogurt makes it lighter, moist and gives a lovely aroma !! I love using greek yoghurt in baking – great from a health point of view and also adds a wonderful texture. When I was growing up in NZ strawberries were always ready right at Christmas time, so for me they always remind me of family gatherings and pavlovas topped with cream and ripe strawberries! I love the sound of the spiced strawberry sauce and the cake sounds yummy! Lovely photographs, particularly the second one with the board. Recipe sounds great. This cake looks beautiful. 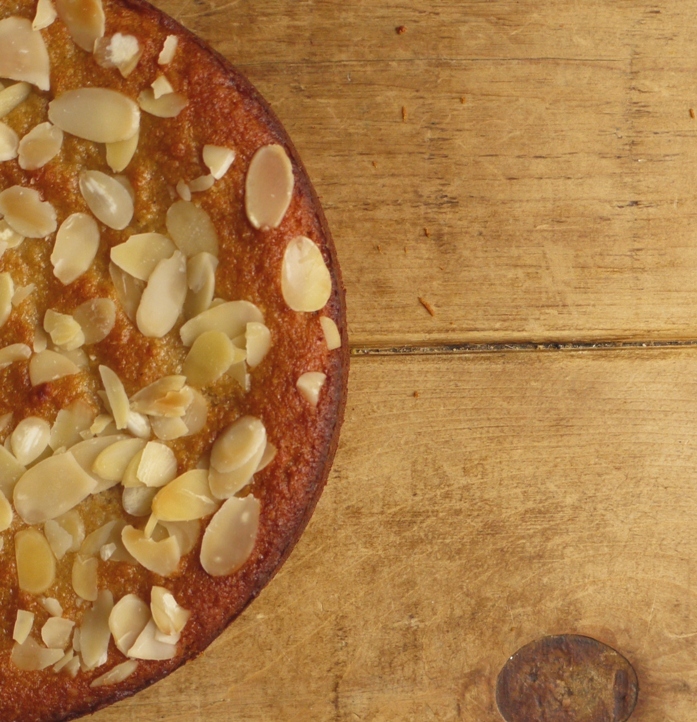 I love cakes made with almonds and spices! Even though it’s winter where I live it is still warm enough that we have a winter crop of strawberries. The strawberry sauce looks delicious and I look forward to trying it soon. This sounds like such a lovely combination, just the right mixture of sweetness and spice. Really beautiful pictures too. The strawberries in the first picture look so inviting, summer in a picture if you ask me! I started baking with yoghurt again recently and I agree that it’s such a great ingredient – it gives cakes a wonderfully moist crumb without the guilt of eating a butter-laden cake! (Can you tell I like to eat cake for breakfast?). Also like the idea of serving the strawberries on the sde – O just experimented with strawberries in muffins and must say I don’t like the flavour or texture of baked strawberries one bit! Gorgeous – I now really want this for breakfast! Very intrigued by the strawberry sauce, I’ve never cooked strawberries like that before but can believe it works. The strawberries aren’t cooked, it’s a completely raw sauce, simply marinaded in the spices and syrup. I’m never 100% sure about cooked strawberries, I think the water content is a bit high. definitely book marking to make – thanks! Your writing is so lovely, and your photos too, that I really enjoyed reading about summer in the UK. And drooling over cake! Thanks so much for starting my week of on a sweet note! Aw, thank you so much for such a lovely comment – what a wonderful way to start the week! what a lovely recipe! and the ginger with the strawberries definitely sounds good. what i want to know is where do you buy your crates of strawberries? A pure heaven delight. Marking it and making it:). Pictures are awesome n rustic! It looks like sunshine on a plate, got to one of your five a day right? Really lovely sounding and looking cake. Beautiful. me oh my, this looks so perfect i can hardly stand it! I think cinnamon is acceptable all year ’round. 😀 This cake is beautiful! I’d love a slice right now!! I have just heard that due to the recent rain, the strawberries are plumper than ever! So, they may be late but they are extra fat and tasty so all is forgiven British weather! This kind of simple cake is just what I like to eat and your spiced strawberries sound like a delicious pairing. Thank you for sharing another great recipe. What a very lovely looking cake – and those strawbugs look pretty scrumptious too. Roll on the Summer! I would love to have this for breakfast. Looks delicious and hearty. Love the idea of a spiced strawberry sauce too! Yum!! Love almond meal based cakes and the idea of adding some spice to the strawberries is definately one i will have to remember. 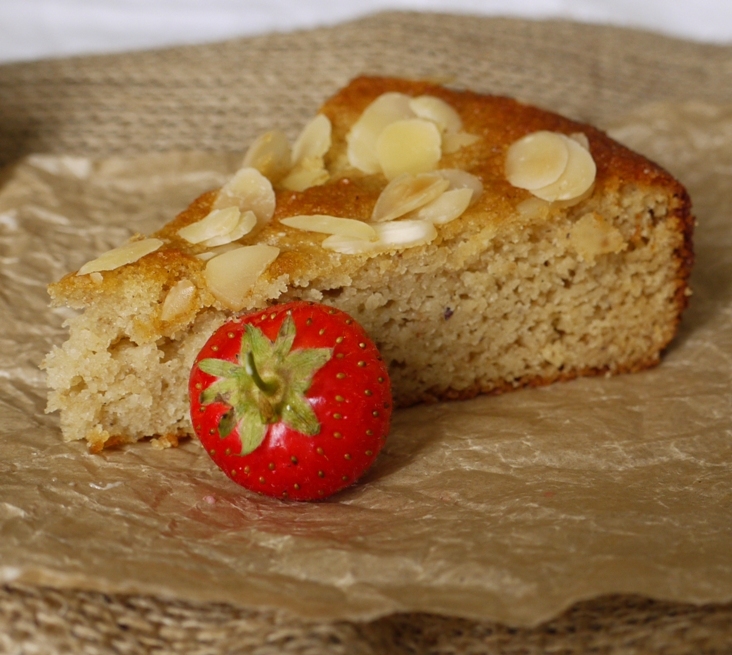 Oh now I do have to try spiced strawberries, and honey almond cake is definitely something I would enjoy as I have a very good pot of honey in my cupboard and this is the cake to use it in! So funny! 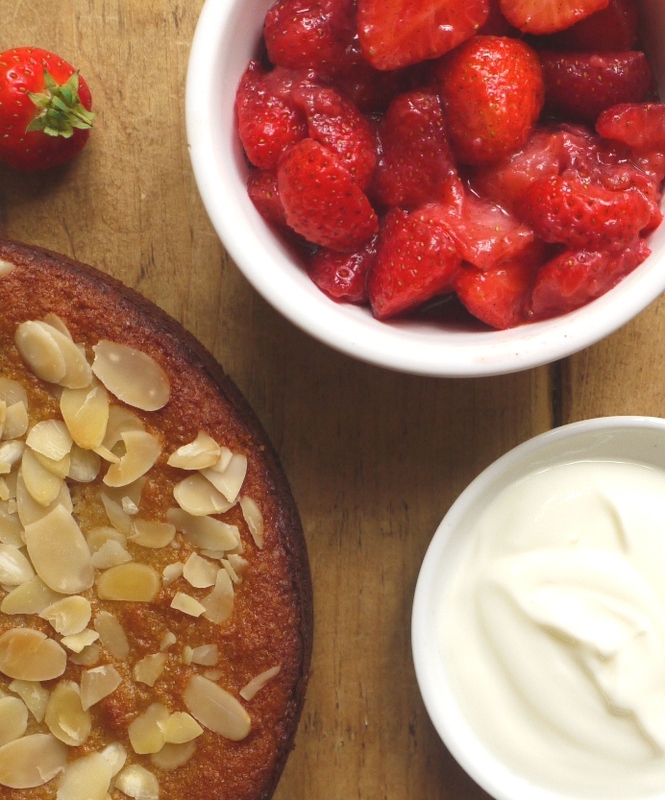 I have a recipe for almond torte with strawberries and creme in my book… great minds think alike;) Don’t you feel that almonds and strawberries are made for each other? Yessss! I don’t know why I’ve never baked with strawberries and almonds together, but this recipe just makes me feel dumb (and hungry)! This dessert has my name written all over it. I love these flavors. And strawberries are my favorite fruit, so you imagine I am in my fruit-eating glory over here. I think they might well be mine too 🙂 Hope you’ll be posting some sort of summery fruit-related recipe soon! That sounds like a perfect match, I’m all about summer fruit these days too! What a lovely combination of flavours. As I sit here listening to it rain outside, I realize those warming notes would be welcome here, too. For some reason, I love anything with sliced almonds on top. And this is a gorgeous recipe with those spicy strawberries! Not common, but I think the flavors here are fantastic Kate. 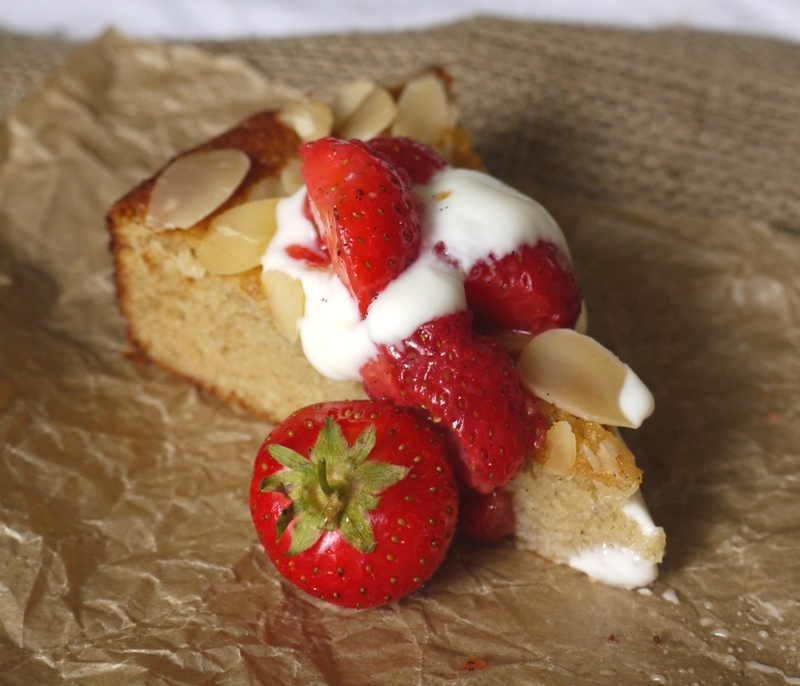 Strawberry season makes me endlessly happy and I adore the idea of pairing them with this honey almond cake. Simple but so delicious. So I attempted making this… doesn’t look quite as pretty as yours but tasted great!